I'm all about funny and really enjoyed this little swag-gift.! If you don't know, The Ellen Show is very fun and clever. Keeping in theme with the show I came across this absolutely hilarious swag gift that Ellen gave out recently. Packaged in a white satin pouch was the sleep eye mask set. The satin pouch had "The Ellen Show logo" printed on the front, and the mask had an image of Ellen's eye's on the outside. So when you wear this of course it gives you the funny goo...goo Ellen eyes! This is taking an ordinary product and making it extraordinary by adding an image and a logo. Only in LA can you zip down the 405 to catch a ROCK concert in the OC on a week night! 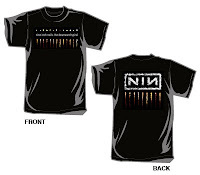 Nine Inch Nails and Janes Addiction rocked the Verizon Amphitheater in true ROCKSTAR style. Usual rock concert swag to report from the T-shirts to branded picks (I think Dave Navarro blew me a kiss and winked at me OMG...OMG...OMG ;-). The real promotion was by the venue Verizon Amphitheater, they had these huge screens and in between sets the screens prompted you to text the number and you could instantly post your personalized message right there in front of the whole crowd...AND enter to win a new phone. Brilliant! Click to read how awesome the show was according to the LA TIMES. OMG, really!! When I heard about this I thought to myself, now that is a fabulous promotion!! It seems one of the new pool side amenities compliments of the Beverly Hills Montage are "Couture Loaner Shades." 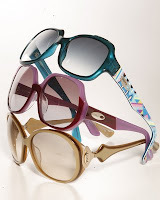 In addition to the designer sunglasses the Montage is also giving free foot messages and free smoothies. Now I don't have to be a spelling bee winner to spell out what fantastic mileage a promotion like this has for both the Montage and Pucci. In hard times, brands need to think outside the box for more grass roots approaches to marketing. "See you pool-side at the Montage, I'll be the one wearing the Pucci SWAG!" 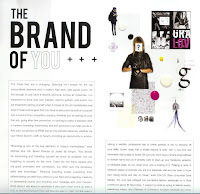 In this months issue of Dialogues Magazine there is a wonderful article about the importance of "branding yourself" aka: swagging yourself. It's no longer just the big corporations marketing themselves but to be competitive in the job market no matter what your profession is, it is extremely important to build a brand for yourself OF yourself. Your brand should be a window to your skills for outsiders, it can be an online portfolio of projects or professional reel showing off your talents. It's crucial to know marketing trends and to stay competitive in all marketing scenarios! The weather was delightful this evening for The Grove's debut Fashion Show at Barney's Coop. I was actually having dinner with friends when the outdoor party started and models start sashaying their way down the catwalk. Click the image to read who debuted at the show and to see images. 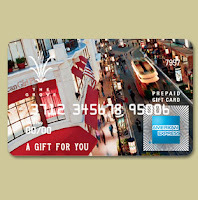 I report the swag and found my opportunity at the Concierge counter of The Grove LA, with my exclusive offer from the Grove and AMEX to have my very own Amex-Grove Card! Consider a image-music download card for your next promotion, same concept but the image card has great imprint capabilities and brand mileage. Having just celebrated my Birthday at "the happiest place on earth," I'm happy to report they have a promotion going on right now that's "out of this world." In 2009 every person registered at disney.com gets into the park for FREE. Such a clever promotion, as I walked Disneyland it occur to me that thousands of people and I share the same birthday. Like me all of these people had a group with them (who were not free of course) but OMG how smart of a promotion is that...your not going to go by yourself! Aside from that I received a birthday swag keepsake pin that Said "Happy Birthday Michelle!" This weeks post is plucked from the MyStyle.com shop-it-list. 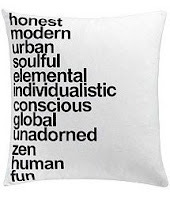 I take project inspiration myself often from retail and this pillow is available from CB2. This pillow makes for fantastic branded SWAG. I recommend adding value to your club events and VIP areas with your own personalized message. "Get Creative & add your signature SWAG stamp to every event!" I'm very excited to have been included in this months issue of "Dialogues Magazine"-Fashion Institue Magazine. Of course my write up is all about my career in SWAG...an often overlooked yet very important part of any marketing campaign. 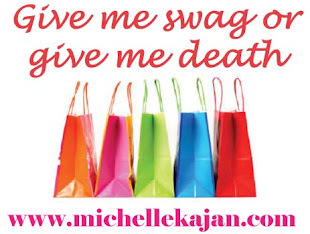 I've been invited on a few different occasions to speak about SWAG and swag trends at corporate events. This is a service I'm happy to offer (I love shop-talk) ask me for more details! Anytime your traveling, you are responsible at some level to pick up a gift or gifts for those special people. It's no surprise that any gift that has a logo on it IS indeed a promotional product...no matter which state or country your visiting. A few little impressive SWAG pieces I thought to write about just coming back from travelling in Europe was actually given out on my Swiss Air flight. Swiss Air flight attendants passed to all the children on our flight little branded Swiss Air puzzles and finger puppets to keep them entertained during our long flight. Adults on our flight were treated to swag socks, blankies and pillows. 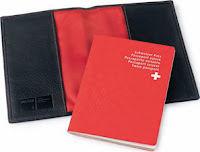 Swiss Air like many airlines also offers a rewards program where you can redeem your points for branded SWAG products. Swiss Air has a very impressive company store I encourage you to browse it for swag inspiration and remember "Smart Companies Sell their SWAG through REWARD PROGRAMS." Click the link to view the Swiss Air Online Store.